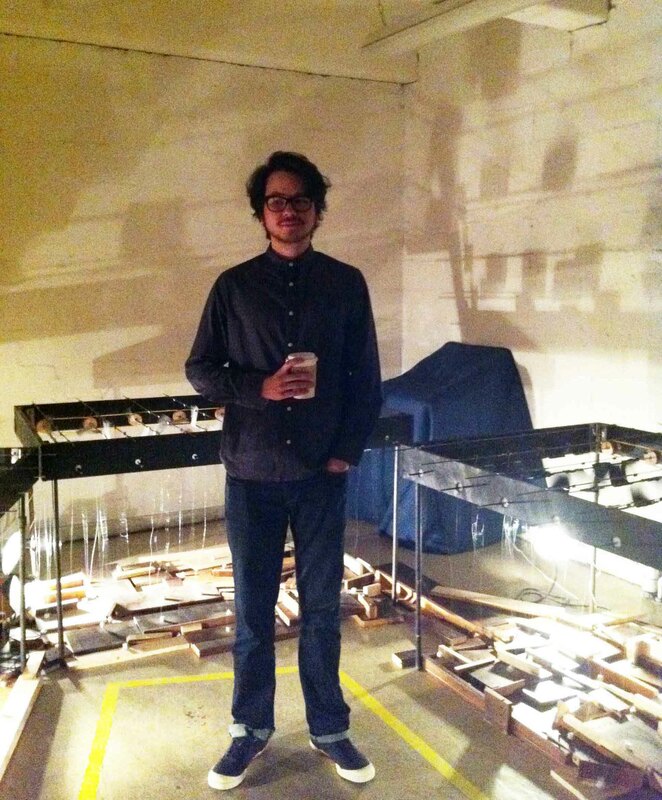 The first two students in the newly-established Sound Arts MFA program, Carla Cisno and Nolan Lem, presented their work in the First Year Show, at Prentis Hall, from May 4-12, 2014. The works presented were What is all (2014) by Cisno, and Dice Roll (2014) by Lem. Video clip at this link (please note that the audio is ambient room sound, and not part of the piece). Cisno’s piece What is all was presented in two spaces: in a smaller room, an aluminum tray of water was activated by a low-frequency analog oscillator, connected to the tray via tactile transducers. The low-frequency oscillator, nominally set to a steady state at 50 Hz (but as the artist pointed out, being vintage analog equipment, drifting somewhat around that frequency) transmitted vibrations into the pan of water, causing wave-like ripples throughout the liquid. A cool-colored beam of light was positioned above the tray, illuminating both tray and liquid (the image above shows the artist near this installation). 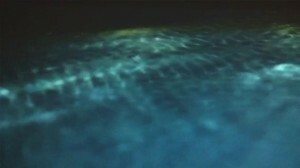 Video of the tray and water were captured, and projected in two places: on the wall of the small dark room containing the tray, and, transmitted live via HDMI, to a larger separate room, in a floor-to-ceiling display. One interesting feature of her piece was that the sound is not heard directly (but can be felt when touching the table holding the tray), but rather, is seen in its effect on the liquid and light. Video clip of Dice Roll at this link. 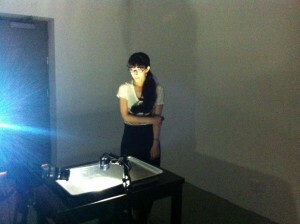 Lem’s Dice Roll was installed in a single rectangular room, with the piece lit from below, casting shadows on the walls of the semi-darkened space (see artist in front of work in image at top of page). Lem’s piece featured 3 large rectangular frames, with rows of mounted motors, activating thin lines supporting dice. The dice, when at rest, sat on a bed of pieces of wood, of varying lengths, arranged for their sonic properties. 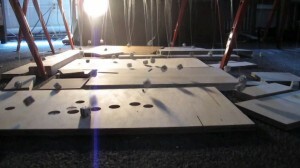 When activated, the dice rolled and bounced against the pieces of wood, producing a variety of organic-sounding effects. Different textures were in evidence over time, without forming any large discernible structural patterns. The artists both spoke in a panel at the closing reception, discussing their work with Douglas Repetto, Director of the Sound Arts program, and Deborah Cullen, Director and Chief Curator of the Wallach Art Gallery. 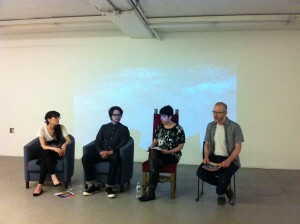 There was a lively discussion, which touched on issues including ideas about the definition of sound art, ideas about form, approaches to the sense of time in their work, the creative process, and documentation and preservation issues for sound art pieces. The Music & Arts Library actively supports the work of the Sound Arts program, by acquisitions of books, journals, and recordings, as well as the resources of the Digital Music Lab. We eagerly look forward to seeing the next exhibition of work by this group and the new incoming cohort (an additional 4 artists) in Fall 2014! This entry was posted in Events, Exhibitions, Sound Arts, Video on May 14, 2014 by Nick Patterson. 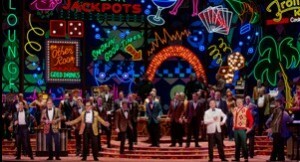 The recent, Las Vegas-themed production of Verdi’s “Rigoletto” is included on Met Opera on Demand, available through the Libraries under “Databases“. (I’m looking at you, Music Humanities students !) … but, any opera lover will find plenty of interest on the site, including several other productions of Rigoletto, and over 450 Met opera productions, in streaming video. Check it out! This entry was posted in E-Resources, Video on December 5, 2013 by Nick Patterson. 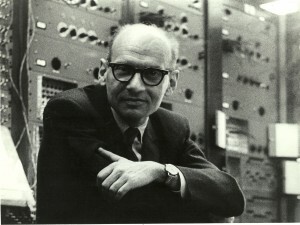 Noted American composer Milton Babbitt passed away on Saturday, January 29th. An obituary in the New York Times is available at this link. Beyond his many accomplishments and influence as a composer, which will no doubt be covered elsewhere, Babbitt participated in the birth and the spread of electronic music in the United States and beyond, and did so right here at Columbia. He was one of the founding directors of the Columbia-Princeton Electronic Music Center (along with fellow composers Otto Luening, Vladimir Ussachevsky, and Roger Sessions), established in 1959 to formalize and draw together many strands of electronic music research and activity at Columbia University and at Princeton, and initially funded by a grant from the Rockefeller foundation. One of the most noteworthy pieces of equipment in the newly-established Center was the RCA Mark II synthesizer, unique at the time, which allowed programming of many parameters of the sound via binary codes punched into paper rolls. It also allowed precise specification of rhythm, a feature which attracted Babbitt greatly to the synthesizer, and it would be Babbitt who became the composer most associated with the RCA Mark II (with technical support from Center engineer Peter Mauzey). The image at the head of this post shows Babbitt in front of the RCA Mark II synthesizer (early 1960s?). The RCA Mark II was installed at the Center, in Prentis at 125th Street, where it filled most of a room. The non-working synthesizer remains there to this day (it ceased working after a mid-1970s break-in damaged the equipment). The Center lives on today as the Columbia Computer Music Center. Pictures of the RCA Mark II, and a brief history of the Center, are available at this page on the Computer Music Center web site. A few fascinating oral history interviews with Babbitt are available via The Video Archive of the Electroacoustic Music, including one describing his work with the RCA Mark II. There is also an interview from this source posted on YouTube, if you have any problems playing back the first source listed above. Babbitt also provided a detailed summary of the use of the synthesizer from a composer’s perspective, in his article “An Introduction to the R.C.A. Synthesizer”, in Journal of Music Theory, 8, no. 2 (Winter, 1964): 251-265 (full text available in CLIO, see this link and navigate to vol.8 no.2). WKCR will be broadcasting a Milton Babbit 24-hour marathon, beginning around 1am tonight and running through 1am early Wednesday morning, both over the air and streaming online. Tune in to hear some of Babbitt’s ground-breaking and influential music. You can continue your listening by browsing the recordings available in the Music & Arts Library in 701 Dodge. Try searching on keywords= Milton Babbitt , and limit your search to “music sound recordings” to exclude books and scores. You can also find some streaming audio recordings, via the Libraries’ audio databases Database of Recorded American Music (DRAM) , Naxos Music Library, and Classical Music Library. Don’t hesitate to ask Music Library staff for help if needed, either at the circulation desk, or at musiclibrary@columbia.edu. In addition, there is some material by Babbitt contained in the archives of the Center. This material, including some musical sketches, working notes, scores, punched paper rolls used to drive the RCA Mark II synthesizer, and a small amount of correspondence and ephemera, is in the process of being transferred to the Columbia University Libraries, for preservation, proper storage, and cataloging. Some photos and information on the archives of the Columbia-Princeton Electronic Music Center are available here. This entry was posted in Announcements, Archives, Video and tagged Announcements, Archives, Video on January 31, 2011 by Nick Patterson. 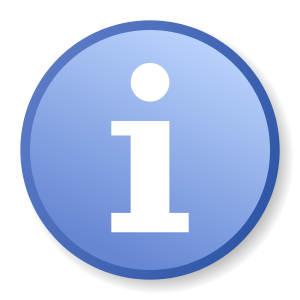 You can browse a listing of electronic audio databases, under “E-Music and Sound Collections” under the “E-Resources” tab on the Libraries’ home page. There are some terrific resources here! These last three may all be found by title, under the “databases” search box on the Libraries home page. All these databases offer streaming audio or video content, and are available from any computer on the campus network, or from off-campus to full-time students, faculty, and staff via login with your UNI and password. Please let us know what you think! Comments welcome here, or at music@libraries.cul.columbia.edu. This entry was posted in Audio, Databases, E-Resources, Video and tagged Audio, Databases, E-Resources, Video on February 3, 2009 by Nick Patterson.